RG Ainslee continues the Secret Cold War Series with a fast-moving adventure filled knife-edged tension and Cold War intrigue. 1980: Ross Brannan is back and out for revenge — determined to hunt down the traitor, J. Andrew Marsden — at any cost. The Škorpion Brigade, a band of German terrorists, teams up with Libyan Dictator Gadhafi and rogue ex-CIA operatives in an explosive plot to obtain nuclear materials. Marsden is rumored to be in Libya. Ross and a multi-national team are dispatched to find Marsden's base of operations. In an instant the mission is compromised, and Ross is propelled on a roller-coaster ride across Africa in a heart-stopping tale of action, adventure, and suspense. The Sahara Intercept is filled with stunning double-crosses and twists of plot as this fast-paced story moves from the streets of Rome to the sands of the Sahara, and finally, to an epic showdown on the Syrian border. THE SECRET COLD WAR SERIES reveals the silent conflict waged in the shadows. THE SAHARA INTERCEPT: A ROSS BRANNAN THRILLER, is the fifth installment in the Secret Cold War series a new addition to the tradition of military, espionage, and adventure novels loved by fans of Alistair MacLean, Robert Ludlum, Clive Cussler, and Tom Clancy. The author served as a soldier on the front line of the Cold War following the Cuban Missile Crisis. The Secret Cold War series novels are set in Africa and Southern Asia, areas the author has traveled extensively. 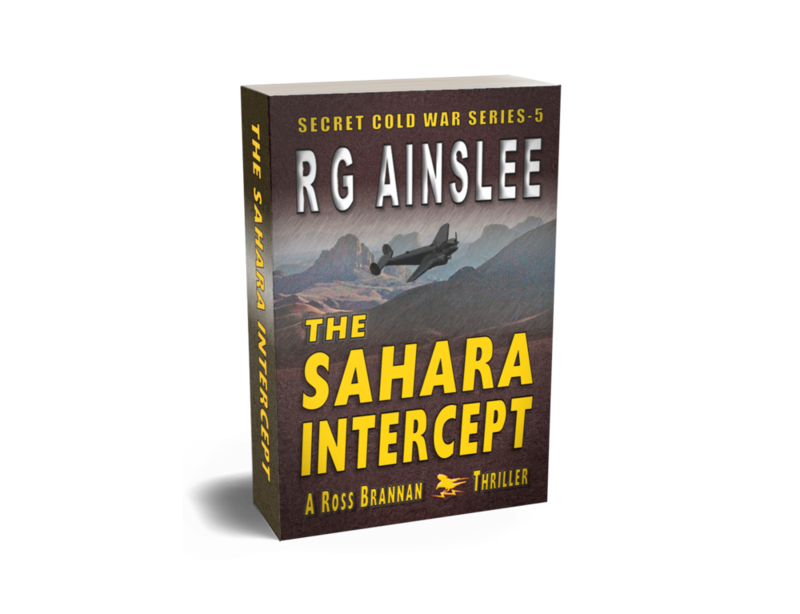 THE SAHARA INTERCEPT: A ROSS BRANNAN THRILLER transports you to the secret front line of the Cold War. A Full-length novel | Book Five in The Secret Cold War Series. This book can be read as a standalone novel. December 1977, I arrived in Bangui, the capitol of the Central African Empire, a few days after the coronation of Emperor Bokassa. Eager for a change of fare, I happened on a small cafe and enjoyed a fresh dish of yogurt. It was delicious. A large picture of Colonel Kaddafi hung over the door, the owner was a Libyan expatriate. The next day I was laid-low by a vicious stomach bug, naturally, I blamed the yogurt, and Kaddafi by association. A few weeks later, while eating lunch in a gravel pit in Eastern Zaire, I found an expended .50-caliber armor-piercing tracer bullet. The next day I arrived in Kisangani, a city still not fully recovered from dystopian violence of the Simba rebellion supported by Che Guevara. I kept the bullet, and after some research, I presumed it to have been fired from an aircraft piloted by Cuban exile pilots employed by the CIA during the nineteen-sixties. Cubans fighting Cubans in the heart of Africa. Kaddafi and Che, two players in the Cold War bringing conflict and suffering to the people of central Africa. The Sahara Intercept attempts to give the reader a glimpse into the secret cold war in the heart of Africa, using a fictional story interwoven into a timeline of real events. 1. The Ustica Mystery: The Italian airliner was shot down on 27 June 1980. A bomb or a missile was suspected, but no official blame was ever assigned. 2. Bombing of the Railway Station in Bologna, Italy on 2 August 1980. 3. Incident with U.S. Air Force ELINT Aircraft on 16 September 1980. 4. The Libyan Invasion of Chad. 5. Military coup in Turkey on 12 September 1980. 6. Libyan attack on N'Djamena airport by Libyan Tu-22s on 9 October 1980. The military units, American, French, Chadian, and Israeli are real and operate as described. The Chadian Air Force used surplus Skyraiders and French mercenary pilots as described in the novel. The cities of Tamanrasset, Agadez, Bangui, and Kisangani are described as they existed in 1977. Kisangani was worse, the author having witnessed two thefts in one day. The Škorpion Brigade and Lukas Penwell's organization are fictional. The Ethiopian Intercept is a new addition to the tradition of military, espionage, and adventure novels loved by fans of Alistair MacLean, Robert Ludlum, Clive Cussler, and Tom Clancy. The Ethiopian Intercept is second installment in the Secret Cold War Series.